Nowadays, many of us lead hectic lives and rarely have time to go grocery shopping regularly, therefore storing food has become an increasingly common practice. Although, with so many different kinds of food containers on the market, it can be hard to choose the right one. Do not worry though, this article will help you understand how you can choose the most suitable food container for your needs. We will also discuss the top 10 best food containers you can buy online in India, to make it more convenient for you to get one. There are several factors you need to think about when choosing a food container, such as the type of food you’d like to store, the material of the container, the durability of the container, and so on. In the following sections, we will explain how you should go about making these choices. Food containers are usually made of plastic, glass or steel, and each of these materials has their own merits and demerits, so you should choose the one that best suits your needs. Plastic containers are great for those who want lightweight and unbreakable options. They are also suitable for those who need containers to not only store dry ingredients, but also reheat food in the microwave. There are both airtight and non-airtight plastic containers available so you can pick whichever ones you prefer. It is important to check they’re safe to use though, by making sure they are BPA free and they’re made with grade 2, grade 4, and grade 5 plastic. 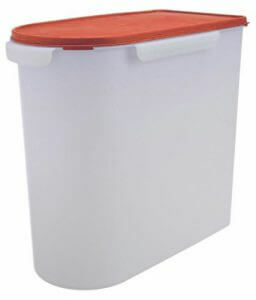 It is also better to use polypropylene containers as they do not release any harmful chemical. 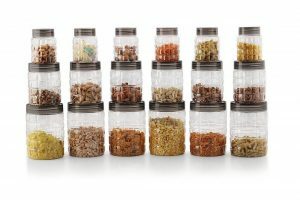 Glass containers can be used for storing leftovers as well as raw veggies or meat, and are easy to clean as they don’t get stained like plastic. They are durable, hygienic, and both microwave and dishwasher safe. 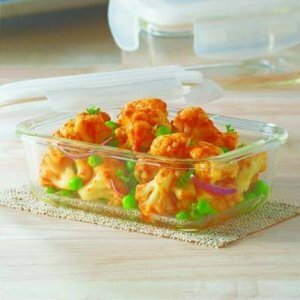 Borosilicate glass containers can also be used for cooking, baking, and reheating food. However, glass containers need to be handled with care, and therefore, are not recommended for homes with little kids. The lids of these containers can be made of plastic as well as glass; although in either case, you must check if the lid fits as the container would be of no use otherwise. Stainless steel containers work for all types of households, whether it’s someone living alone, or if it’s a nuclear family or even a joint family. These containers are sturdy, easy to clean, dishwasher safe, and have a long life. Steel containers are not see through though, so you would always have to open the container and check what has been stored. Furthermore, they cannot be used in microwaves, and they get scratches easily if they’re not cleaned with care. Selecting the right shape for a container helps save space as it makes optimum utilisation of space by allowing you to stack multiple containers. The size of a container is also important as it must be appropriate for the amount of food you usually need to store. Legumes such as dal, rajma, chhole etc., usually come in packs of 500 grams to 1 kilogram, while rice and wheat can often come in much larger packs, going up to about 25 kgs. Therefore, to store these food items you would need containers ranging from 500ml to 1000ml as 1ml is a bit less than 1 gram. Depending on your need you might need to get even larger containers or much smaller ones. The material also needs to be considered depending on the size. A 1000ml steel or plastic container is much better than a 1000ml glass container as glass containers are heavier and would be difficult to store in high places. Plastic and steel ones, on the other hand, wouldn’t have this issue and are therefore recommended for dry storage. Since we don’t need to store large amounts of food in the fridge, we do not need huge containers, and 200ml to 500ml ones would be more than enough. Rectangular or square shaped containers are recommended as they are easier to stack and make the most of the available space. As for the material, glass containers are much better for this type of storage, as they do not stain easily and are also see-through. They’re also better than steel and plastic containers as they are microwave safe as well, so you can easily warm the leftovers. 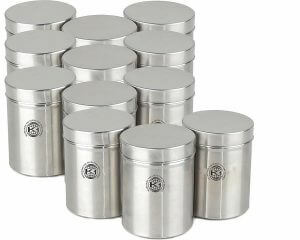 Let us now reveal our picks for the top 10 food containers you can buy online in India. We have included various types of containers, so we hope you will be able to find one to suit your specific needs. 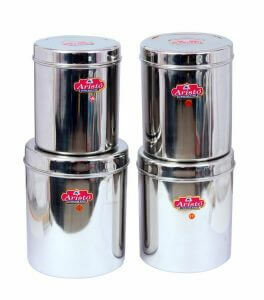 This set of four food containers of 230ml each is recommended for those who often need to carry dry snacks with them. Even though they’re small, they’re still quite sturdy, and won’t get damaged in your bag. They are also great for storing small amounts of leftover food in the refrigerator. Although, with daily use, the lids may become loose and spill the contents in your bag. They aren’t see through either, so you would have to open them and check what has been stored. Furthermore, these are advertised as being leak-proof, but in reality, they aren’t, so it would be better not to carry curries or soups in them. 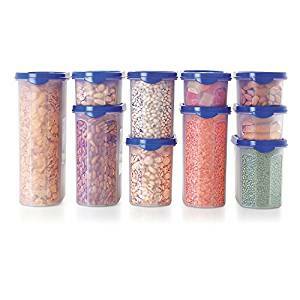 This inexpensive set of differently coloured plastic jars makes it easy to identify what has been stored in them and is recommended for those who appreciate colour coding. Since these jars aren’t too big, only small amounts of dried fruits and nuts, or wet items like tamarind or pudina chutneys can be stored in them. 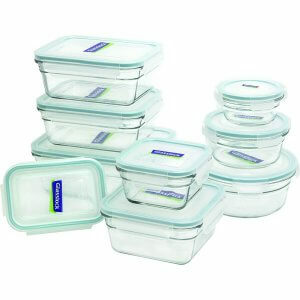 They can only store about 250 to 300 grams of food, so they’re not great for those who need containers for bulk storage. Additionally, the lids aren’t made of the best material and may start to rust after a few washes. The exterior plastic body may also develop scratches over a period of time if it is handled roughly. 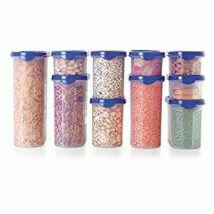 With 6 pieces for each of the three sizes, this is an inexpensive set of 18 BPA free, PET plastic canisters. It is recommended for a small family that needs unbreakable and odourless containers for dry storage of pulses, spices, and snacks. Furthermore, since the containers are stackable, they are also great for saving space. On the downside though, they are not as big, and although the largest sized ones are said to be 1200ml, it is hard to store even 1kg of nuts and larger legumes in them. In addition, the plastic is quite thin, and the containers may start melting if they are exposed to high heat. These petite, square shaped glass jars are come in a set of six and are not only perfect for storing spices, but also for homemade pickles, jams, and chutneys. 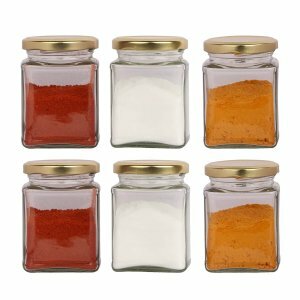 They are recommended for those who want affordable glass containers to store around 150 grams of powdered spices in. However, since glass is a breakable material, these jars wouldn’t be the best choice for homes with little kids. They are also quite small, so you would need to keep refilling the jars almost every month. Additionally, these containers are not recommended for storing whole spices in as these are too tiny for those. If you’re looking for a space-saving plastic container to store 15 to 20 kilograms of atta and rice, then this product is perfect for you. It comes with handles on the sides to make it easier to lift, as well as an airtight lid to prevent any unwanted exposure to moisture. It is quite an expensive item though, so if you’re not looking for something specifically for bulk dry storage, then this won’t be of much use to you. Furthermore, since it isn’t transparent, you would have to open the container to know whether a refill is necessary. 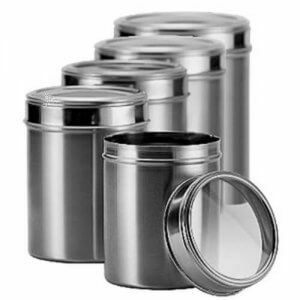 This is a set of 4 high-quality stainless steel containers for dry storage, and the canisters are of varying capacities, of about 3 to 6 kilograms each. They are made of sturdy, durable steel, and are recommended for households that consume large amounts of legumes and grains. 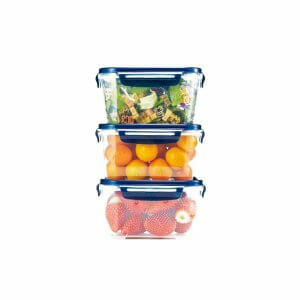 Even though the lids fit perfectly, they’re not 100% airtight and are therefore not the best for storing food items which can go stale. Although these containers are some of the most expensive ones on the list, they’re not microwave-safe or leakproof, so their use is quite limited. With 3 BPA-free plastic containers of 1 litre each, this set of 3 containers, is perfect for those who are looking for something to store cut fruits and vegetables or leftover food in. These lids of these containers are completely airtight, so you can refrigerate cut fruits and veggies in these for almost a week. The only reason these haven’t made it to a higher rank, despite being affordable and microwave-safe as well, is because of their size. Since these can only hold about 1 litre of food, which is around 950 grams, they would only be sufficient for a nuclear family. These food-grade plastic containers come in a set of 10 pieces, with one 500 ml, three 1.1 litres, three 1.7 litres, and one 2.3 litres containers. This set is recommended for those who want containers for dry storage, as well as for use in the refrigerator and freezer. The containers won’t let your snacks go stale either as their lids are almost completely air-tight, and you can use these containers to warm leftovers too as they are microwave safe too. Additionally, they are great for saving space, and they are really affordable, so they won’t hurt your wallet. 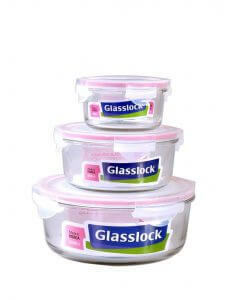 This set of 3 glass containers, with one container each of 400 ml, 950 ml, and 2050 ml, is recommended for those who want something to store leftovers as these are both airtight and microwave-safe. Since they are made of glass, they do not retain stains, which makes them really easy to clean. These containers would also last for a long time if they are taken care off, so despite seeming expensive initially, they would end up saving you money eventually. Furthermore, these containers have leakproof lids, so you can easily store curries, soups, and raitas without any worries. 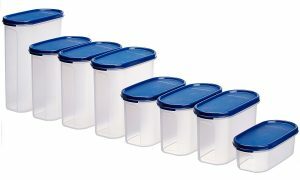 The best food containers on the market, this inexpensive set of 10 sturdy containers is recommended for those who want containers that can be used for various types of storage. Since there are one 2.4 litres and two 1.8 litres boxes, this set can definitely be used for dry storage of pulses, grains, or snacks. Additionally, it has three 1.2 litres boxes and four 600 ml boxes, so it can be used to store food in the fridge. It is microwave safe as well, so you can conveniently pop these in the microwave when you want to warm the leftovers. The containers are also stackable, so they are great for those who want to save space. Food containers may seem like something you do not need to pay as much attention to while buying, but after reading this article, we are sure you must have realised how important it is to know what sort of food container is best for you. 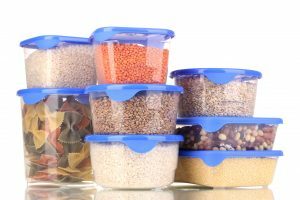 We have discussed how you can choose a food container based on your specific requirements to make the most out of your purchase, and we’ve also introduced our top 10 recommended food containers. We hope we’ve been able to help you to find the perfect option for yourself!